John W. Hagan (1836-1918) lived in the Cat Creek community near Rays Mill (now Ray City), GA. He served during the Indian Wars in 1857 with Captain E.T. Kendrick’s Company of Florida Mounted Volunteers. In the Civil War, he served with the Berrien Minute Men and wrote a number of Confederate letters from Civil War battlefields to his first wife, Amanda Armstrong Roberts (1843-1872). Following her death, Hagan was married in 1874 to Mary Smith, daughter of Owen Smith; she was the widow of Aaron L. Giddens and daughter-in-law of Isbin Giddens and Kiziah Knight. 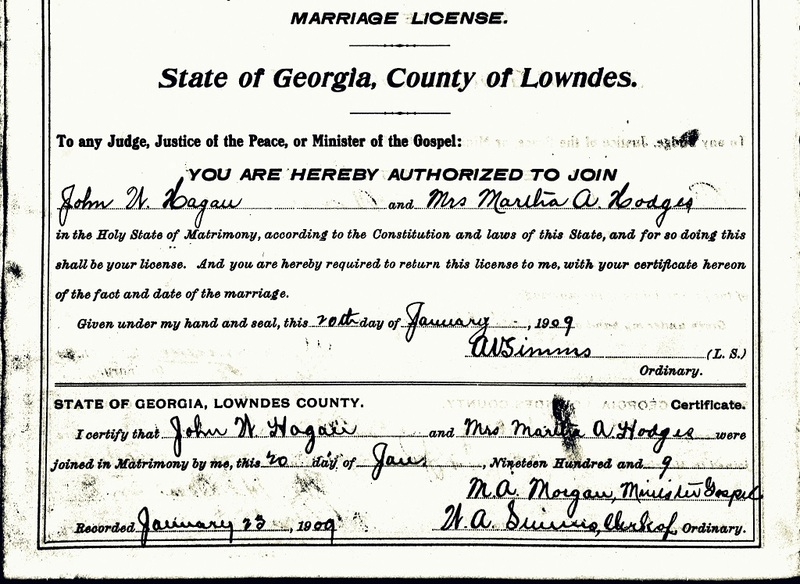 Third, Hagan married Mrs. Martha Lawson Hodge, widow of Thomas B. Hodge and Lewis M. Ayers. John W. Hagan was a prominent citizen, who served as chairman of the Lowndes County board of commissioners, representative in the Georgia legislature, leader in the Populist party, board of directors of the Alliance Warehouse Company, and was one of the incorporators of the Valdosta and Fort Valley Railroad Company along with William Roberts, James W. Roberts, W.B. Folks, Henry B. Holliday (father of Doc Holliday), Joseph Ousley, and W. G. McAdoo, and others in 1873, although it is not clear that there was ever any material construction of this line. John W. Hagan married for a third time in 1909. There is some truth in this statement is proven by a matrimonial event in Valdosta yesterday afternoon at the home of Mrs. Martha D. Hodge, the widow of the late Thomas B. Hodge. The contracting parties were Hon. John W. Hagan and Mrs. Hodge. The ceremony was performed by Rev. M. A. Morgan and was witnessed by quite a number of the relatives and a few intimate friends of the contracting parties. Much interest was attached to the marriage because of the prominence of the contracting parties as well as because of the fact that both of them had passed the meridian of life, though both are still young. The groom is about seventy-three and the bride eleven years his junior. The marriage came as a surprise to many of the friends of the couple as nothing had been said about it to their friends. It was rumored on the streets yesterday morning, but a rumor was all there was to it. The relatives were notified a short while before it occurred and were invited to be present. The groom is chairman of the board of county commissioners, an ex-legislator and has been prominent in the county for many years. The Bride was the widow of the late Tom Hodge and previous to her marriage to Mr. Hodge was the widow of the late L. M. Ayers, of Hahira. Both parties are well fixed in this world’s goods, and the bride has property valued at from fifty to seventy-five thousand dollars. They have many friends who hope that their last days may be their best and that happiness will attend them on their journey down the evening of life. John W. Hagan and Mrs. T. B. Hodge were united in marriage at Valdosta last week by Rev. M. A. Morgan. No announcement had been made of the approaching nuptials, and the news came as a surprise to their friends. The groom is 74 years of age and the bride about the same. It is the third venture of the groom and the fourth of the bride. Both are prominent. The groom is chairman of the county commissioners of Lowndes county, and an ex-legislator. He was the leader of the populist party there twelve years ago. 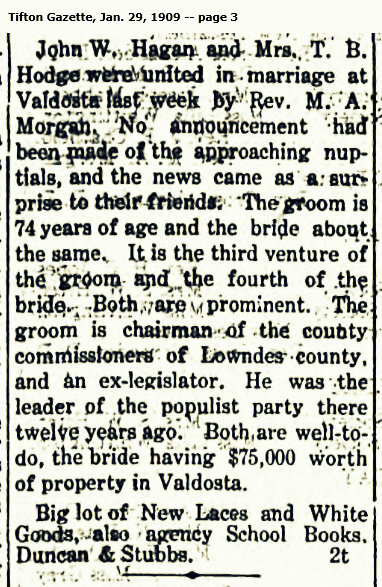 Both are well-to-do, the bride have $75,000 worth of property in Valdosta.